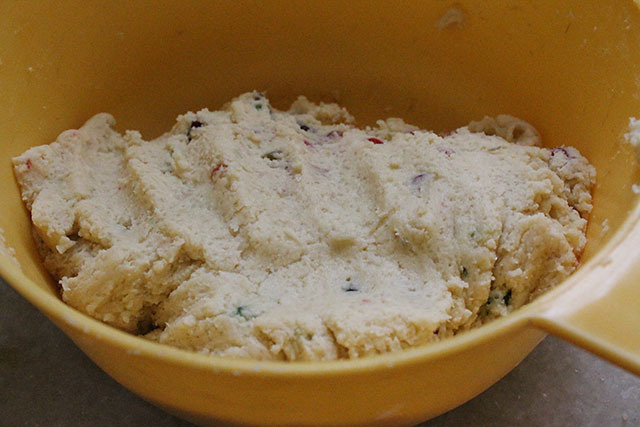 Tutti Frutti Cookies recipe with step by step photos. 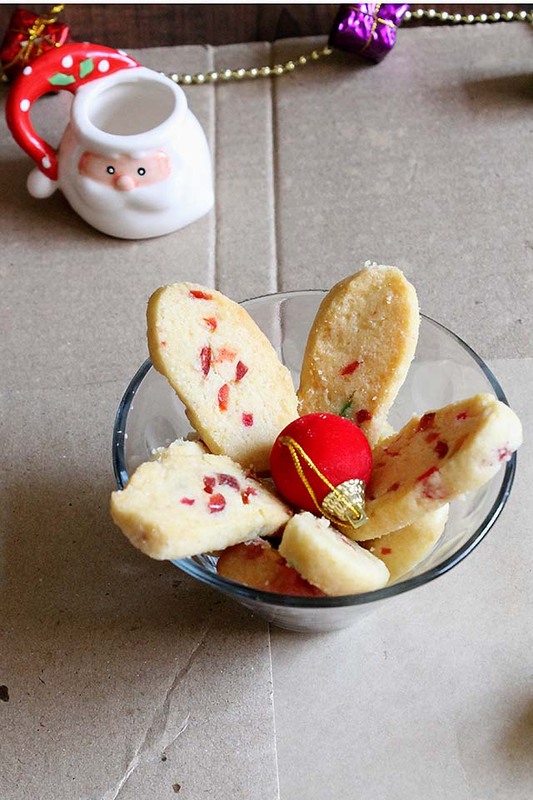 Tutti fruitti cookies is a sweet delight made during Christmas 🙂 What is Tutti Frutti? 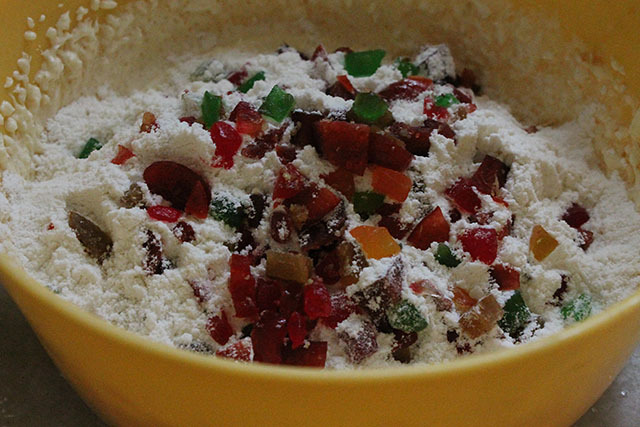 it’s a colorful confection consisting candied fruits. In India Tutti Frutti are papaya cubed and candied into various colors like green, red and yellow. As a child I loved these cookies and still have special place in my heart for them. 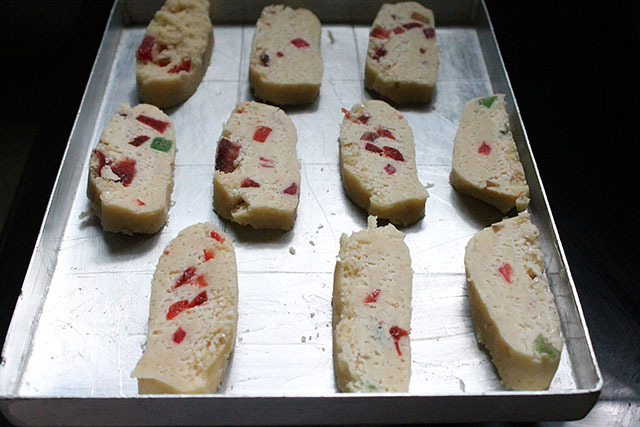 In India we have many recipes made from Tutti Frutti like icecream, cookie, cake, bread etc. Even karachi fruit biscuit are similar to these cookies. 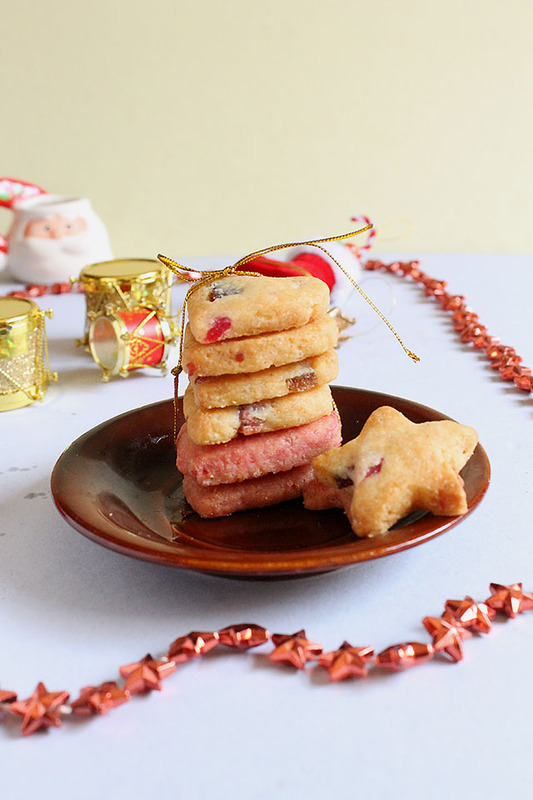 I have given a slight twist to these cookies have added orange peels, lime zest, glazed cherries, dash of rum and vanilla essence. Generally cardamom powder is added I have added vanilla essence. These cookies are easy to make. I have made added some beetroot water for pink color. Hence some cookies are appearing pink in color. Further I have made them in star, heart and oval shapes. This dough is required to be chilled into the freezer for 20 mins forming into a log shape. Later take a sharp knife and slice into 1/2 inch width. You could cut the dough with cookie cutter but that is slightly difficult. As you would have to roll it out and then give the desired shapes. I have followed my own recipe with my my own gut hence it comes out well. Sometimes I feel I am a good blind baker wonder if it’s good Or bad 😉 but don’t worry will provide you with appropriate measurements. Overall enjoyed my day today made vegan tutti frutti cake which was a disaster. Later made these cookies and then ginger chocolate bread which was yum. Had guacamole, french fries and corn chili pulao for dinner. 1. Preheat oven to 200°C exactly fifteen mins before baking. But reduce the temperature to 160°C while baking the cookies. 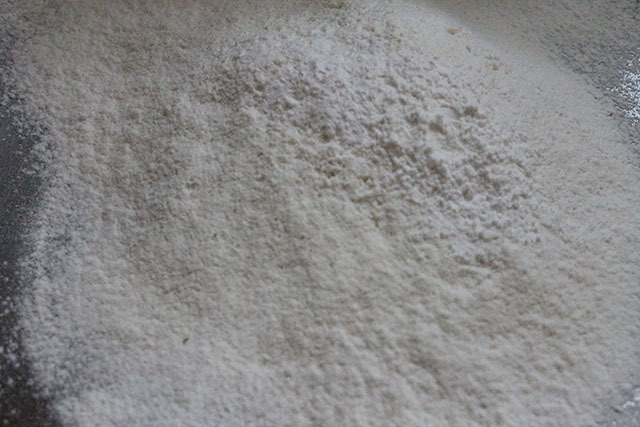 Sift flour, cornflour, salt and baking powder. Grease the pans and keep ready. 2. Cream butter and powdered sugar until smooth and creamy. 3. Add rum and beat again until combined nicely. 4. Time to add sifted flour, peels, tutti frutti, lime zest, cherries and vanilla essence. 5. Mix all and knead into a soft dough. Place the dough on a butter / parchment paper and roll the dough into a log shape. Chill this log into the freezer for 30 mins. 6. Remove the butter paper and slice the log into 1/2 inch width with the help of sharp knife. Alternatively you could roll the dough on the butter paper and cut with a cookie cutter and give desired shapes. 7. Bake at 160°C for 12-15 mins Or until the skewer comes out clean. Once the cookies are slightly brown towards the edges that means it’s done. Please don’t overbake them if you feel it’s not done then bake for some more time. Allow the cookies to cool down then store them into an airtight container. 8. 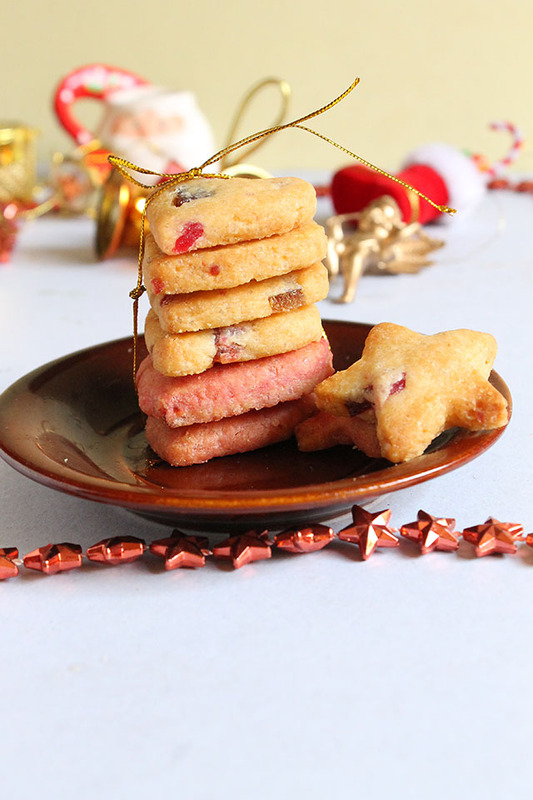 Serve tutti frutti cookies with tea Or coffee Or as a Christmas treat. You could check some of my best cake recipes like chocolate ginger bread, eggless chocolate truffle cake, molten chocolate lava cake, vegan red wine chocolate cake and basic chocolate chiffon cake. Preheat oven to 200°C exactly fifteen mins before baking. But reduce the temperature to 160°C while baking the cookies. Sift flour, cornflour, salt and baking powder. Grease the pans and keep ready. Cream butter and powdered sugar until smooth and creamy. Add rum and beat again until combined nicely. Time to add sifted flour, peels, tutti frutti, lime zest, cherries and vanilla essence. 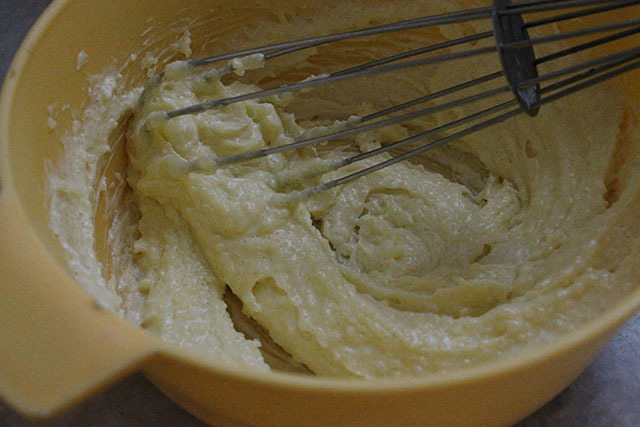 Mix all and knead into a soft dough. Place the dough on a butter / parchment paper and roll the dough into a log shape. Chill this log into the freezer for 30 mins. Remove the butter paper and slice the log into ½ inch width with the help of sharp knife. Alternatively you could roll the dough on the butter paper and cut with a cookie cutter and give desired shapes. Bake at 160°C for 12-15 mins Or until the skewer comes out clean. Once the cookies are slightly brown towards the edges that means it's done. Please don't overbake them if you feel it's not done then bake for some more time. Allow the cookies to cool down then store them into an airtight container. 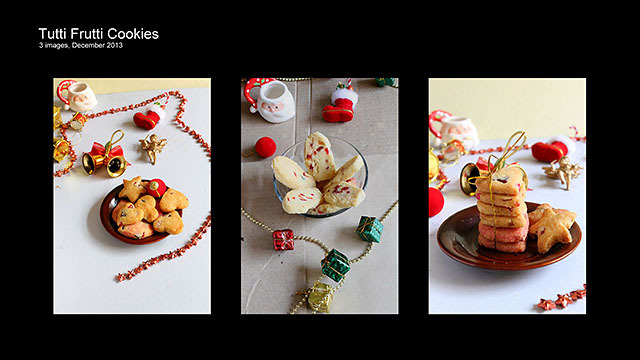 Serve with tea Or coffee Or as a Christmas treat. If your cookies aren't baked bake them for some more time as all oven have different capacity and temperatures. Also chilling the dough is important for better result. If you don't have peels Or cherries it's fine juts use tutti frutti. 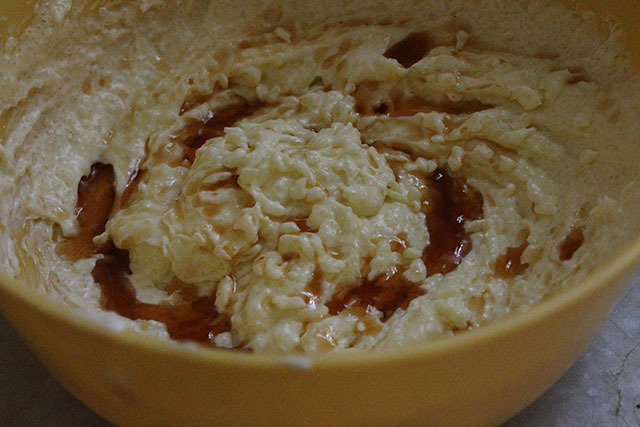 beautiful recipe Maria. However, I have a basic question. why do you chill the log before cutting out shapes? what’s the purpose behind it? Also, how much time do you thaw or look for before you cut out the shapes from the frozen log? Thanks! Shreya when you chill the dough, its easier to form shapes via moulds orc cookie cutter. Also if you slice from a sharp knife into thin rounds then no need to thaw. But if you wanna give shapes from cutter then thaw for 15 mins, till you can give shapes and form to the dough. any substitute of lime zest? please do reply. i am gonna make this today for my brother.. Awesome.. 🙂 Will surely try it out..
Thankyou Farida 🙂 do try and keep me posted. 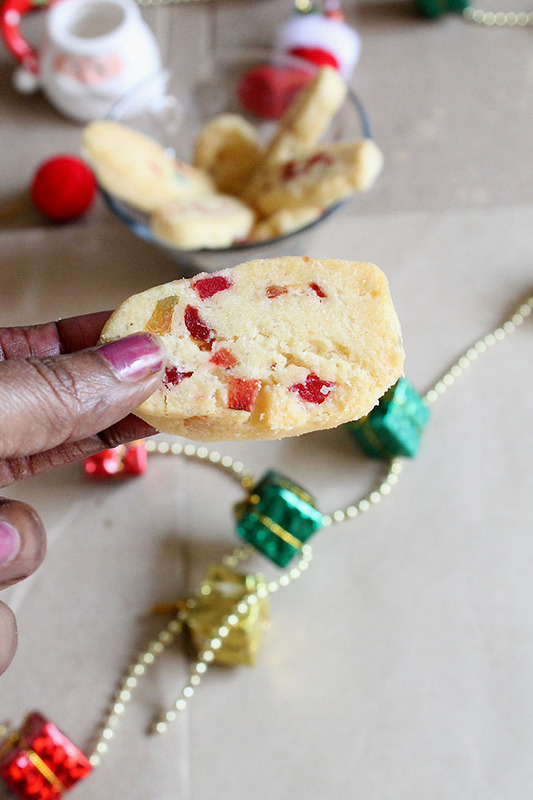 Amazing..this tutti frutti eggless cookie. i really liked it very much. These cookies are just looking so awesome. These cookies reminded me of childhood days.